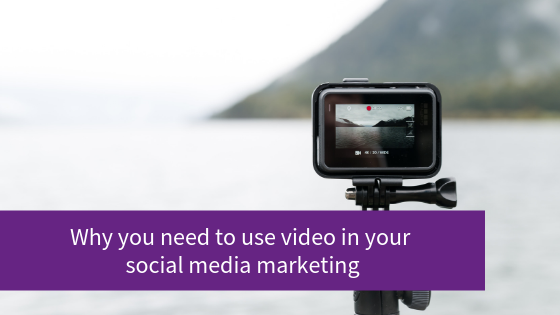 If you use social media for business, you have surely heard that video is where it’s at. Using video for marketing has become a priority for businesses over the last couple of years and it will only continue to rise in dominance. As Mark Zuckerberg said in Facebook’s Q3 Earnings Call “video is a critical part of the future”. In a study of over 777 million Facebook posts carried out by Buzzsumo, they found that video posts got at least 59% more engagement than other post types, outperforming photos by 73%. Through Facebook’s own research, they found over half of video content is viewed on mobile. By 2021, it is estimated that 75% of mobile data will be video. According to BuzzSumo’s research, the optimal length of a Facebook video is between 3 and 5 minutes. You can, of course, create up to 4 hours of video (perhaps a tad long!) but the research seems to suggest that the spike in watching is around 3.00 – 3.20 minutes. However, it’s not about sharing links to YouTube videos. In fact, this will just to serve to harm your reach. Remember that YouTube is a competitor of Facebook so they aren’t going to like it if you send people there from Facebook. Instead, go ‘native’ i.e, do Facebook Lives or upload your video directly to Facebook. A bonus is that the interaction rate for native videos on Facebook is nearly 109% higher than those linked to YouTube. It’s not just on Facebook where video is king. On Twitter, tweets with videos are 6 times more likely to be retweeted than those with just photos. Linkedin has recently introduced Live video. Whilst live video hasn’t been rolled out to everyone yet, you can still utilise LinkedIn’s native video in your marketing. In fact, another good reason to consider using video on LinkedIn is that research suggests videos on LinkedIn are getting shared 20+ times more than any other content. Hopefully, some of these stats will encourage you to incorporate more videos into your social media strategy. So what sort of videos can you create? Mari Smith, Facebook marketing expert, suggests “edutaining” your audience. — educating them about something within your niche and doing it in an entertaining way. There are many forms a video can take and it depends on your particular product, service, style and goals. If you aren’t ready to appear on camera just yet, there are many video creating apps that enable you to create videos from images, text, blog or podcast content. Take a read of my blog post ‘5 Apps for Creating Social Media Videos‘ to find out which ones I recommend.